After an Olympics-induced three-week hiatus, the show is back. 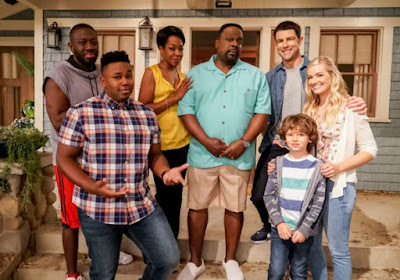 Lest you think maybe they were going to let Kevin stay dead, this episode just went down the rabbit hole of what's become so very wrong with everything. Death doesn't mean much anymore to us as viewers, because lo, they can just come back as ghosts. Ain't no respect for hipster demons. Lest you think I am giving anything away, put that thought to rest. Within the first few minutes of the episode, the brothers are haunted in the bunker by some ghostly being, and theorizing that it can't be any decades-old ghost just now showing its face, it must be Kevin, despite Dean burning his body. Yep, he's there. Because he can't get in to Heaven due to the whole Metatron thing, so he's stuck in the Veil. Yada yada, he's heard from another ghost that his mom is still alive and tasks the Winchesters with finding her to set things right. Meanwhile, Castiel is in pursuit of Metatron. He meets up with some dude who was following an angel lady named Rebekah, but this faction has been slowly killed off by Bartholomew, who has a couple of his angel minions take Castiel to his place to have a nice little sit down chat about how they used to be friends and fought together and blah blah, he wants to work together to find Metatron and be the leaders of the angels. Sam and Dean track the ghost Kevin heard it through the grapevine with to a shady storage facility. Storage facilities can be quite shady, in fact. It turns out that indeed, Mama Tran has been kept in this storage facility for quite some time now. At first, she used to get regular visits from Crowley along with his young demon cohort, but after awhile Crowley stopped coming. Hmm, I wonder why? That left the demon dude to stew in his juices and get altogether cranky. 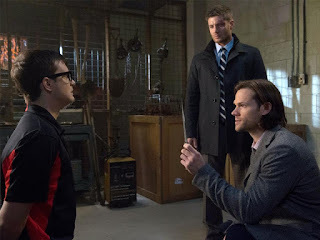 He whacks Dean over the head, but Sam and Mama Tran work together to get her out of her cell and she gets the honors of killing her torturer. Just your normal, angel-to-angel chat about killing. Back in Bart land, Castiel is on the verge of feeling somewhat accepting of this plan to unite, until Bartholomew wants to start killing off angels who don't see things their way. 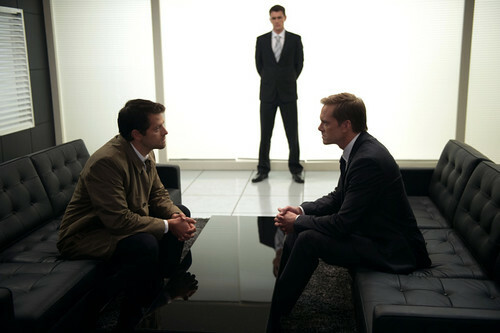 This, naturally, leads to fisticuffs, which, duh, Castiel wins. He tries to take the high road, but ends up stabbing Bart in the gut for his trouble. One good thing comes of this, however - he gets some of Bart's followers on his side now, ready to help him out. The brothers bring Mama Tran back to the bunker and reunite mother and son, despite one being, you know, a ghost. She wants to keep Kevin with her (he's tied to the bunker by an old ring of his father's that she can take with her) until they get the gates to Heaven open again. Kevin tries to give the guys some real talk about getting the hell over their drama, but Sam is having none of that quite yet, and storms off to his room mere seconds after the Trans leave. - For being an episode about the overall arc of the season, this one felt pretty non-important. Not really a whole lot going on. - I'm sick of dead people coming back, downright sick of it. Death has so little meaning anymore, I'm not sure what could give it meaning again. - I am happy, however, to see that the *spoiler alert* Ghostfacers are going to be back for the next episode. Their episode in season three is actually one of my all-time favorites. I know some people don't agree, but you're just downright wrong, I tell ya! Hilarity. - How much longer is this drama between the brothers going to go on? Please dear GAHHG not much longer. Not a lot this week. Boo hoo. Kevin: It's bad in here. Like DMV line times infinity bad. Kevin: My mom's taking home a ghost. You two, you're both still here. Thanks for the review. So you're giving it low points, eh? Beg to disagree. Seems to me, the whole thing is not about fight between good and evil, not anymore. To me, now it is a story about these people who having everything in the world to be happy and proud are nevertheless sad and self-loathing. Love doesn't conquer all, because people don't want to understand. If the show ends sad or bloody I wouldn't be surprised. It's a drama after all, not some horror-action movie.